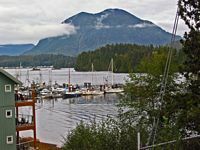 Vancouver Island: an adventure too far? We are on our way to Vancouver Island and, once again, I recall that vacations bring a tremendous amount of waiting. We left my mother’s home in Toronto at 4 PM by airport limo, arrived at the airport at 4:30 for a 7:30 flight, and waited for 3 hours. It seemed like an eternity. We left on time but then we taxied, to Detroit I think, before taking off. At 460 kilometres in length and 80 kilometres in width, Vancouver Island is the largest Pacific island east of New Zealand. The Vancouver Island mountain range runs the length of the island and divides it into a wet and rugged west coast and a drier more rolling east coast. 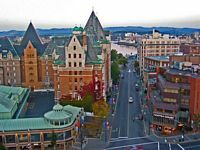 With its temperate oceanic climate (a bit of an oddity in Canada) British Columbia’s capitol Victoria is located on the southern tip of Vancouver Island. We landed there 15 seconds after the time that was printed on the ticket. I guess they’ve done this before. There were two flights arriving in the Victoria International Airport. That pretty much overloaded the place. Wait again to claim your luggage. Then a final painful wait for the airport shuttle bus to fill. About 20 minutes later, when it was finally full, there was absolutely no one left in the airport terminal. About a 40 minute shuttle bus ride got us to our downtown hotel. I awoke abruptly at 1:25AM with an excruciating cramp in my left calf which quickly escalated to blinding pain in both calves. Remember all that waiting we did? Three hours airport, five hour flight, half hour shuttle, forty minute ride; that’s a lot of inactivity for me. I got up at 6:30AM and thought it seemed awfully dark, so opened the drapes to discover that it was awfully dark, full moon and all. Wasn’t ready for that. I also didn’t expect downtown Victoria to be absolutely desolate at this time of morning. Even on a Saturday; try that in Toronto! The only way to see Victoria and get a true sense of all it has to offer is to explore it on foot. The very picturesque and historic Empress Hotel and the Parliament Buildings are a pairing that is quite common in Canadian capitol cities. One last little hike took us to Mile 0 – the beginning of the Trans Canada Highway. The surrounding park is appropriately adorned with a statue of Canadian hero Terry Fox. Up at 7AM, pack, breakfast, a 9AM rental car pick up and we’re off to Tofino. Nestled as the mountains come to rest on the west coast of Vancouver Island, Tofino is a popular summer tourist destination. It attracts surfers, campers, hikers, whale watchers, fishermen or anyone just looking to get close to nature. All good reasons and that is why we are heading there. The road from Victoria to Nanaimo is nothing short of annoying. One town after another and a traffic light (usually red) every kilometre or so turn a leisurely drive into a test of patience and endurance.. However, once you turn west and head inland from the east coast you enter Cathedral Grove. Famous for its stand of ancient Douglas Fir trees, some more than 800 years old and 9 metres in circumference, this walk back in time draws people from all over the world. The ambiance and charm of a Bed and Breakfast was more to our liking and lifestyle than one of the many resorts in town. Wilp Gybuu (Wolf House) was most peaceful and comfortable. The magnificent beaches and rainforest trails of the Pacific Rim National Park are nearby. The crashing waves of Tonquin Beach are just a short walk from the b and b. More on that in a moment. We were up very early to go whale watching. Decked out in a PFD suit, we literally flew in a 12 seat zodiac. Tofino is a very unique area. Surrounded by mountains, from the water it looks more like the south Pacific than Canada. As promised, we saw sea otters, sea lions, harbour seals and grey whales. They spout, surface, roll their backs up then dive back down again. There is just something about this activity that captivates me. To be so close to these behemoths is so surreal. You have to experience it to understand it. In this case, to say that this tour blows is a compliment. The 4 kilometre Willowbrae Trail with the Half Moon Beach side trip follows an old corduroy road through a heavy cedar forest, there’s a lot of up and down and a lot of stairs and ramps. A good workout and an interesting hike get you back to nature in the most scenic way. Bear watching is a lot harder than whale watching. 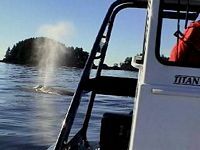 It’s relatively easy to see a 30 or 40 foot beast rise out of the water, compared to spotting a dark spot on a rock beach 500 yards away. However, that’s what guides are for and the reward is just. 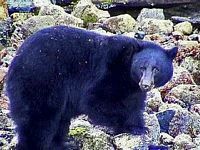 The bears are very methodical in how they make their way across the beach, rolling over rocks, checking for sand crabs to eat. It is truly mind boggling to realize the strength of these animals when you see them overturn boulders that you’d swear would require a bulldozer to move them. It was advised locally that you catch the sunset from atop Radar Hill at least once during your stay in Tofino. We did. They’re wrong. However, take that short walk from the b and b to Tonquin Beach and you will be treated to a sunset that you will never forget. The display of colour and definition we saw this evening rivals anything I have seen anywhere in this world. I’ll be surprised if I see anything this nice ever again. We arrived back in Victoria around 2 PM, dropped off the car and got a lift down to Harbour Air. We have decided that rather than spend 3 hours on the ferry that we are going to take the “business man” travel choice and go by seaplane. 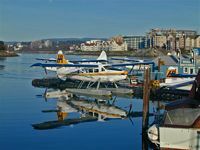 Our flight is scheduled for 4:50PM so we are off to do the tourist thing and visit the Victoria landmark Empress Hotel. A visit to their Rose Garden was very relaxing and enjoyable. We were going to take tea until we found out it was $48.00 per person. I guess that comes with a trip to China. The Harbour Air terminal is a scaled down version of a real airport. One thing I found humourous was that the emergency exit was fully blocked by two chairs and a newspaper box on the inside and a large baggage cart on the outside. Safety first! At 30 minutes in length, the flight was tres cool. What a great way to see all the islands in the sound between Victoria and Vancouver. A 12 seat sea plane offered a bone shaking, gut wrenching take off, an incredibly smooth and scenic flight, and an unbelievable soft landing. We got a free shuttle to the airport and another shuttle to the beautiful Sandman Airport Hotel. It’s okay – well, first impressions are not always right. Blood on the linens and dirt in the bathroom was enough for us to cancel our proposed stay here upon our return from Kauai. For now, it will have to do. It doesn’t matter because we have an 8AM flight to Hawaii so we’ll be out of here by 5:30 AM.